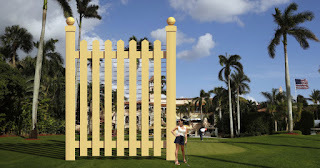 Though unclear if it will get the building permits, Chicago-based architecture studio New World Design wants to cordon off Mar-a-Lago with a gilded picket fence in order to isolate and contain some of the Trump syndicate’s most nefarious forces and minimise their ability to dismantle and do further damage. The satirical statement is in response to the perilous shutdown showdown over funding for Trump’s border wall—now steel slats—which has precipitated a four week partial closure of the federal government with little signs of resolution forthcoming. Irrespective of the fact that the project would be ineffectual and a tremendous waste of time and resources, it does not represent most of the American people and most don’t want to erect a symbol of xenophobia and hostility for all the world to see.